Branchial cleft cysts are common in the neck, but those occurring within the thyroid gland are very rare; we report the occurrence of intrathyroidal branchial cleft cyst. 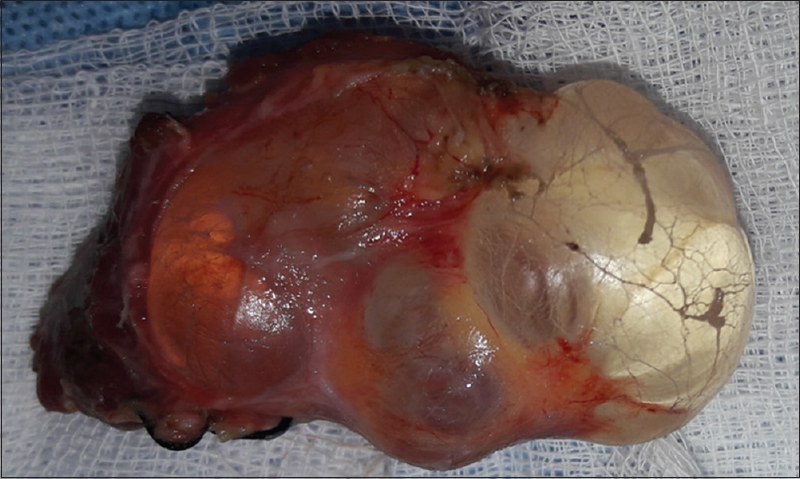 A 42-year-old female presented with a slowly progressive enlargement of her left lobe of the thyroid gland, she subsequently underwent a hemithyroidectomy. The postoperative biopsy was reported as intrathyroidal branchial cleft cyst. Developmental remnants of the branchial apparatus may manifest as cysts, sinuses, or fistulas depending on the presence and location of external or internal communication. Second branchial anomalies are most common, with lesions appearing anywhere along the middle–lower third of the sternocleidomastoid muscle to the tonsillar fossa. Branchial cleft cysts are derived from the embryonic remnants of the branchial pouch and result from incomplete obliteration of the branchial arches that remain dormant until they are stimulated to display cystic growth later in life. Microscopically, the cyst is usually lined by squamous epithelium and mucous cells, with the wall containing abundant lymphoid tissues with germinal centers., They have been reported to occur in unusual sites or organs, such as the oral cavity and parotid gland. The occurrence of the cysts in the thyroid gland is very rare and most reported cases had coexistent thyroiditis.,,,,,, Here, we present a unique case of branchial cleft cysts in the thyroid gland without chronic lymphocytic thyroiditis. A 42-year-old female presented with a gradually progressive swelling on her neck for 2 years. The patient did not complain of dyspnea, dysphagia, or hoarseness of voice. There was no history previous neck irradiation of family history of thyroid cancer. The examination revealed a cystic enlargement of the left lobe of thyroid, which was confirmed by ultrasound examination. The thyroid function tests were normal and the fine needle aspiration cytology done was reported as benign. The patient underwent a left hemithyroidectomy [Figure 1], and the postoperative biopsy was reported as cyst lined by stratified squamous epithelium with stroma containing thyroid follicles suggestive of branchial cleft cyst [Figure 2]. The patient is asymptomatic at 6 months' postoperative and no evidence of recurrence in the other lobe has been detected. In the thyroid gland, most cysts result from degeneration of adenomatous goiter. Other cystic lesions of the thyroid include thyroglossal duct cyst, cystic thymic rest, squamous cyst, and branchial cleft cyst. The histogenesis of intrathyroidal branchial cleft cysts is poorly understood. The commonly accepted theory is that these lesions represent rests in the development of the thyroid gland, which is primarily derived from a midline endodermal diverticulum. The endodermal diverticulum arises between the second and third branchial pouches to give rise to the thyroglossal duct, the isthmus, and significant portions of the lateral lobes of the thyroid. These structures occasionally persist after birth in the form of solid cell nests. These cell nests, although also found in normal thyroid tissue, have also been reported closely associated with these branchial cleft cysts or even as part of the cyst wall., Immunohistochemical studies also suggest a relationship between branchial cleft cysts and solid cell nests with an expression of carcinoembryonic antigen noted in both the squamous lining cells of cysts and the cell nests. Another theory suggests since most of the previous reported cases had a background of chronic lymphocytic thyroiditis, there is a possible role of inflammation in the development of these cysts. However, cysts arising in histologically normal thyroid tissue, as in our case, make this hypothesis of cyst origin less likely. Branchial cleft cyst of the thyroid is rare and may arise from solid cell nest remnants of the ultimobranchial bodies during the embryogenesis of the gland. The presentation is usually of an enlarging neck mass occurring in either lobe or as multiple lesions. Although majority of the cases have been reported with chronic lymphocytic thyroiditis, they do occur in a normal gland, as in our case. It is recommended that this lesion should be considered during the workup of a neck or thyroid mass. This study has not been funded by any funding agency or sponsor. It was conducted without any financial interest. This material has never been published and is not currently under evaluation in any other peer reviewed publication. The permission was taken from Institutional Ethics Committee prior to starting the project. All procedures performed in studies involving human participants were in accordance with the ethical standards of the institutional and/or national research committee and with the 1964 Helsinki declaration and its later amendments or comparable ethical standards. Thomaidis V, Seretis K, Tamiolakis D, Papadopoulos N, Tsamis I. Branchial cysts. A report of 4 cases. Acta Dermatovenerol Alp Pannonica Adriat 2006;15:85-9. Boringi M, Bontha SC, Kaur M, Shireen A. Branchial cleft cyst – A case report with review of literature. J Orofac Sci 2014;6:125-8. Giunta J, Cataldo E. Lymphoepithelial cysts of the oral mucosa. Oral Surg Oral Med Oral Pathol 1973;35:77-84. Weidner N, Geisinger KR, Sterling RT, Miller TR, Yen TS. Benign lymphoepithelial cysts of the parotid gland. 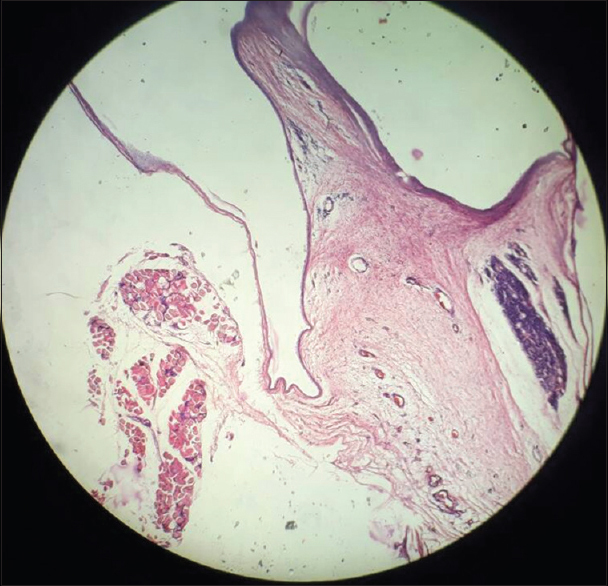 A histologic, cytologic, and ultrastructural study. Am J Clin Pathol 1986;85:395-401. Louis DN, Vickery AL Jr., Rosai J, Wang CA. Multiple branchial cleft-like cysts in Hashimoto's thyroiditis. Am J Surg Pathol 1989;13:45-9. Park JY, Kim GY, Suh YL. Intrathyroidal branchial cleft-like cyst with heterotopic salivary gland-type tissue. Pediatr Dev Pathol 2004;7:262-7. Haba R, Miki H, Kobayashi S, Kushida Y, Saoo K, Hirakawa E, et al. Intrathyroidal branchial cleft-like cyst in chronic thyroiditis. Pathol Int 2000;50:897-900. Radhi JM, Clive PJ. Intrathyroidal branchial cleft cyst in Hashimoto's thyroiditis. AJR Am J Roentgenol 1994;163:229. Asanuma K, Nishio A, Itoh N, Kasuga Y, Amano J. Multiple branchial cleft-like cysts in a female patient with Hashimoto's thyroiditis. Endocr J 2000;47:303-7. Carter E, Ulusarac O. Lymphoepithelial cysts of the thyroid gland. A case report and review of the literature. Arch Pathol Lab Med 2003;127:e205-8. Ryska A, Vokurka J, Michal M, Ludvíková M. Intrathyroidal lymphoepithelial cyst. A report of two cases not associated with Hashimoto's thyroiditis. Pathol Res Pract 1997;193:777-81. Udelsman R. Thyroid gland. In: Greenfield LJ, Mulholland MW, Oldham KT, Zelenock GB, Lillemoe KD, editors. Surgery: Scientific Principles and Practice. 3rd ed. Philadelphia (PA): Lippincott; 2001. p. 1263-82.